Based in Finland, we manufacture light-weight tarp shelters and camping accessories. Our products represent Nordic wilderness tradition at its best. Vihe products are designed to be used with a camp fire in front of them, and serve as a light and functional alternative to a tent – with the added bonus of bringing you closer to the surrounding nature. Perfect for bushcraft, hiking, backpacking, survival, hunting, fishing, scouts and camping. All our products are handmade in Finland. 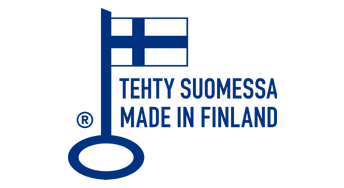 Vihe Vaellus proudly boasts the Key Flag symbol of the Association for Finnish Work as a demonstration of our products being manufactured in Finland. wʌɪld/ a natural state or uncultivated or uninhabited region. wəd/ (forming adverbs) towards the specified place or direction. Wildward was founded in 2012 and has gone on to become known worldwide for the quality and craftsmanship that goes into the products of the Vihe Vaellus brand, attracting the attention of internationally acclaimed wilderness experts such as Ray Mears and Dave Canterbury. For the serious outdoors person, the much-loved Finnish brand Vihe Vaellus is the natural choice for a lightweight yet strong and comfortable piece of kit. Our hand-crafted traditional shelters created with Finnish heritage at the core allow you to enjoy the outdoors more often and for longer by using tried-and-tested Finnish methods that have worked for generations. Vihe Vaellus products are designed to be lightweight and durable so that you can explore, camp and enjoy nature whenever or wherever you want. Our Online store offers a range of products for hiking and camping – from shelters and bugnets to raingear and hiking supplies. Please check the product pages for availability. Guided hikes and courses with professional wilderness guides can also be arranged. We do not have a physical shop but local pick-ups can be arranged. Guidings are as arranged. Manufacturing of Vihe Vaellus products. If you have any questions or would like a quote please get in touch. We aim to answer emails within a few days, but please be aware that at peak times it can take longer to respond. Our time is best spent in the workshop or guiding rather than answering emails. We are not online 24/7.